Friends! I've made us chana masala! with some extra tiny and borderline adorable black chickpeas all wrapped in the most delicious and fragrant curry sauce. I could seriously eat this every day, all day, yes please and thank you. And since chana masala (and really every curry) is basically THE BEST MEAL PREP EVER, you can eat dinner and have all the lunches all week long. This pot of deliciousness keeps getting better. = blissfully easy delicious food all week. Those babies are black chickpeas. Or Kala Chana. Or Bengal Gram. (So many names!) I call them black chickpeas. They look a lot like regular chickpeas only they're smaller and darker. They're dark brown when dried and they lighten up a little when cooked. They're a little heartier than white chickpeas and not quite as creamy. Note: I've never seen canned black chickpeas. If you want to skip the couple hours of cooking (plus an overnight soak) then you can sub canned white chickpeas. This way you'll make chana masala rather than black chana masala. 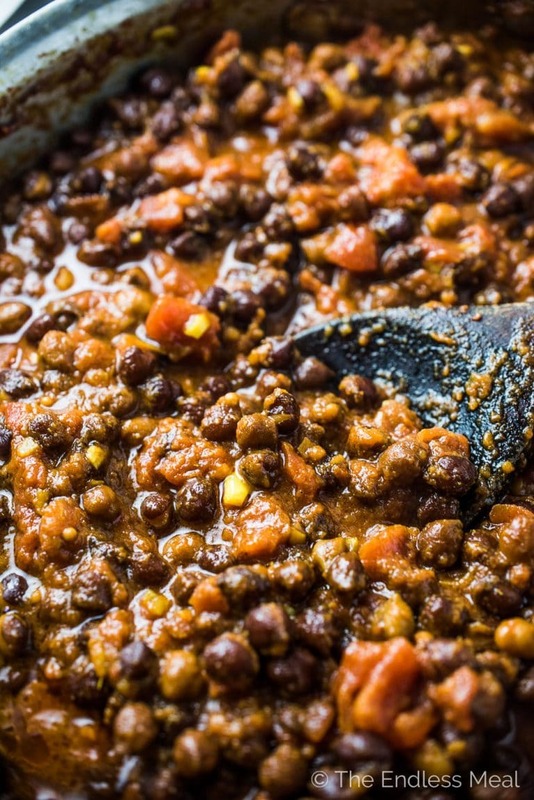 Note #2: If you buy a bag of dried black chickpeas, you can use the rest in this Vegan Dal Makhani recipe. It's so good! I need you to promise me something … whatever you do, don't rush cooking your chana masala. It's an easy dish to make (super easy!) but you need to properly cook the masala. ← That's the fancy word for the onion/ garlic/ tomato/ spice mixture. You want to caramelize the onions well. If you're in a hurry, you won't get all the sweet flavor. Then the tomato paste needs to caramelize. This only takes a couple of minutes, but if you rush past this step you miss the sweetness. Then the spices need to cook in the pan to bring out all the flavor they have. Did you see that picture up there? That's what your pan should look like after the onions, garlic, ginger, and chilis have finished cooking. That's what you should aim for. That's where most of the flavor lives. 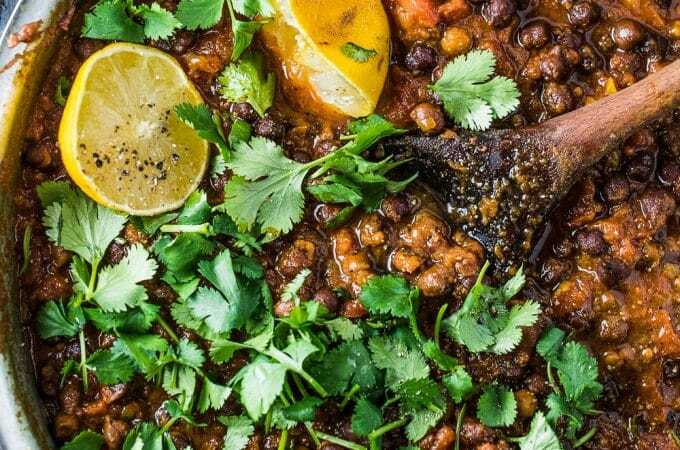 If you love this Black Chana Masala as much as I do, make sure you leave it a 5-star review in the comments below! 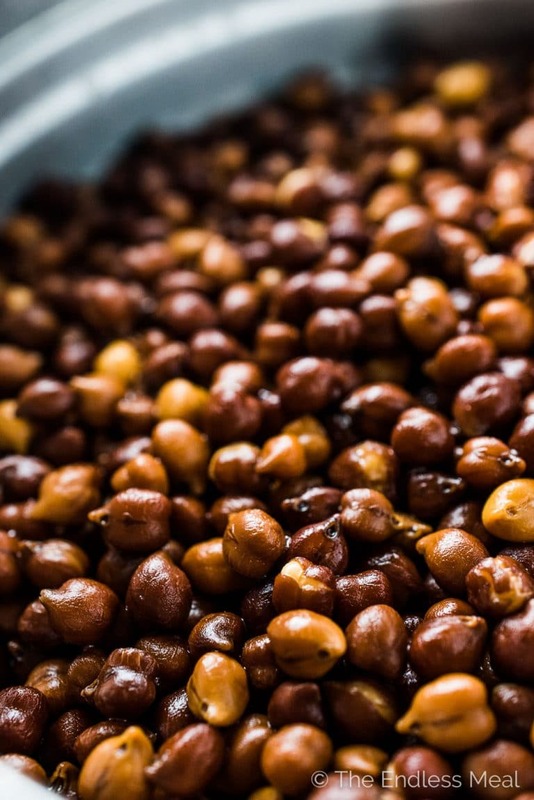 Place the dried chickpeas in a large pot and fill it with water. Let it sit overnight on your counter, or for 8-24 hours. Drain the chickpeas and add fresh water to the pot. Bring the pot to a boil over high heat then reduce the heat and simmer for 1 1/2 hours, or until the chickpeas are soft. Drain and set aside. Push this onion paste to the side of the pan and add the tomato paste. Let it caramelize until is smells sweet and darkens slightly, about 3 minutes. Add the coriander, garam masala, and turmeric to the pan and let it cook for 1 minute more. Add the crushed tomatoes to the pan and gently break them up with a potato masher or the back of a wooden spoon. You want some texture here, just not big chunks of tomatoes. Add the reserved cooked chickpeas, the sea salt, and a 1/2 cup of water to the pan and let it simmer for a half hour. 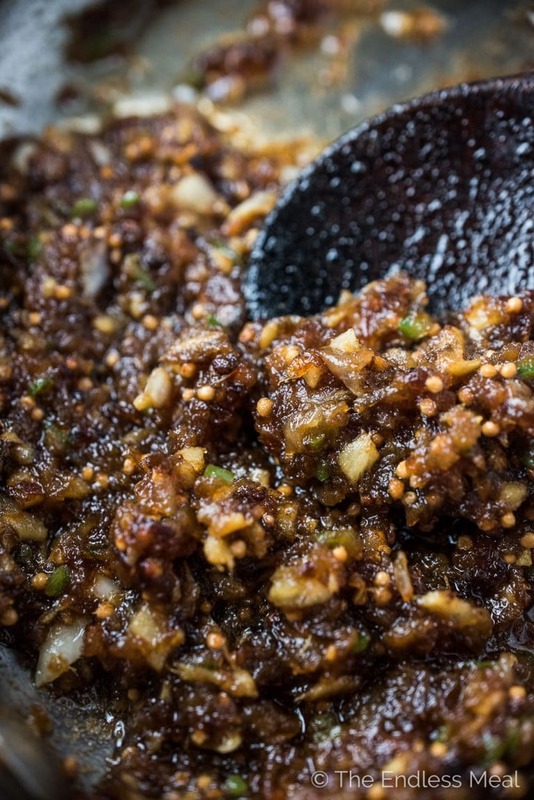 If you're serving this with rice, now is the time to start cooking it. Season with extra sea salt if needed and stir in the cilantro and lemon juice just before serving. One of the best black chana masala I have every made! Thank you for this recipe. I love it!! I am allergic to mustard. Would you just omit or add something else in its place? you can buy black chickpeas at most stores FYI. There is a great shop in New Westminster called Galloways, they have black chick peas and all these spices with killer prices! I used to shop at Galloways when I lived in New West a million (ish) years ago. I loved that place!! I’m sure you can, given the large Indian population there, ask an Indian lol. It may not be quite as richly flavored, but it will still be delicious! Made this today and it turned out amazingly tasty! I used 4 large fresh peeled tomatoes instead of the can, Also, I put in only 3 cups of prepared chickpeas, as this seemed the right amount. My wife and I were amazed how good it came out. I’m so happy you both loved it!! How to get the black colour in kala chana? Or there are special type of chana ? Good recipe. Nicely detailed. I love black chickpea. I bet coconut flakes would be amazing in this! Thank you for the tip!! Made this with regular chickpeas and some dried cilantro (didn’t have fresh). Other than that followed recipe closely and it turned out great. You know it’s delicious when teenagers ask to take home leftovers!!! Haha that is a good sign! So happy everyone liked it! I bought some black chickpeas just for this recipe and it turned out great. May try it again with regular chickpeas when I run out. I bet they’d be good too! I’ve tried it with both and they’re both good. Happy you like the recipe!